Surprisingly, it is hard to find educational yet fun toys these days. The toys sold at the toy store seem to be lacking in both areas. Therefore, many parents and teachers are looking to the internet to find toys that spark a child’s interest and can teach them a thing or two at the same time. Educational Insights® is one such website that offers hundreds of toys for children of all ages. The sight is easy to navigate, and you are bound to find what you are looking for. You can search toys by school subject, theme, brand and much more. Another neat feature is some of the toys were invented by everyday individuals, and the site gives credit to these inventors in a small blurb under the toy listing. It is impossible to pick just one toy that really grabs your attention when visiting the site, but the following two toys are fun, educational, and have individual inventors. 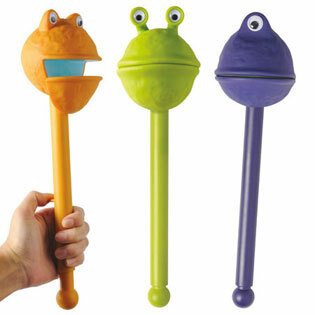 The first is for ages 4+ and is known as Puppet-On-A-Stick. This toy received five out of five stars from those that have recently purchased. Most of the reviewers listed the toy as durable, educational, lots of fun, interactive and engaging. One reviewer planned to use the puppets in her kindergarten classroom, and another said the toys are fun for adults and children alike. Its inventor is Brent Geppert an Educational Insights® employee and games manager. However, he is also a dad that puts puppet shows on for his two sons every night. When putting shows on at home he uses anything from socks to dinner rolls, but he probably added these great toys to his shows after inventing them. The puppets come in a set of three zany puppets on a stick. The mouths of these purple, orange and green puppets move, and will provide your child or the kids in your classroom with hours of creative play. The characters have silly eyes that make them look like fun monsters, but your child can make them out to be whatever they want them to be. Puppets inspire kids to be creative as they have to makeup voices and character personalities. 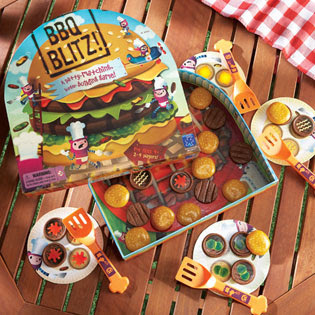 The second toy, known as BBQ Blitz, is a game for ages 4+. The game comes complete with game board, 16 burgers featuring 4 different toppings, 12 buns, 4 plates and 4 spatulas. The game is designed to be played by 2 to 4 players, and in order to win you must be the first to fill your plate with burgers and buns, but you can’t use your hands you must use the provided spatulas to flip the burgers and buns on your plate. The game has three steps. First, choose a fun plate and decide on toppings. Second, flip the burgers on the grill to find your toppings. Finally, win by filling your plate before anyone else. This toy has also received 5 out of 5 stars, and will be enjoyed by parents and children alike. It has also received reviews of being durable, engaging and lots of fun. One reviewer said the game was fun yet simple for her children. The inventor Hans Ulrich has been inventing toys for over 40 years in the United States and Europe . A native of Germany he has even developed a secret hamburger recipe that involves raisins, and is the hit of all his barbeque parties, so he is no stranger to knowing what everyone wants on their burger. Whether you are a teacher or a parent searching for the perfect toy, you will be sure to find it on this great site. They have games, toys that stimulate creative play, toys to teach letters and numbers, and the list just goes on and on. Additionally, for good quality, educational toys the prices are competitive so you will not go broke buying toys. We would like to give away one of each of these products in a random draw held by Random.org on September 12, 2012 from all entries received . Canada and US may enter only. Thanks so much for the giveaway! I love Educational Insights products...especially their time and money themed products! Healthy Foods Stamp Set would be useful to me also at work! Any dishes the grandkids would like. They have so many great products for kids,,this is nice as well,thanks! I really like the Vowels Phonics Puzzles. I would love to win! These are great products for kids to make learning fun and enjoyable. You can always count on Educational Insights for quality toys that make fantastci birthday gifts. Thank you for the giveaway! I love Educational Insights products I love the quality of their toys and the prices! I love the GeoSafari® Jr. Talking Globe™ Jr. These look like amazing toys. My son would love them. Thanks for the contest. I love educational insights toys. They have such innovative, fun products!